When I'm late with a birthday or anniversary greeting, I just say that I'm trying to extend the celebration. Can I get away with that excuse now? The Mid-America was in August! But, as always, it was well worth the time to attend. Here are some visual highlights. the primary one, but after looking again (a few times) I can accept the judge's decision. interface, and the superb match of the pot color to the bark! he earns it. This larch raft planting has been in training since sometime before 1983.
outstanding example of a bonsai that is balanced without being symmetrical. has certainly come up with a creative and effective display stand! 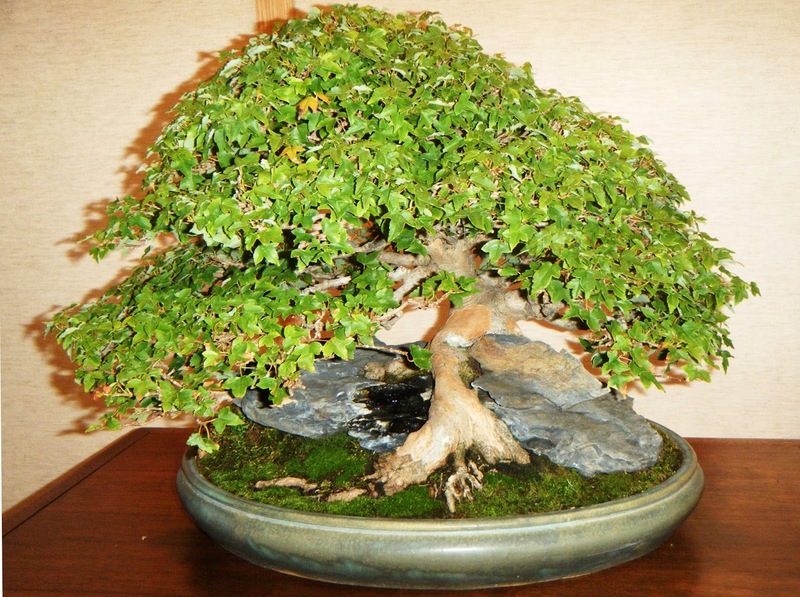 Just a nice hornbeam. The judge thought so too, obviously. windswept while being upright - a combination, by the way, that does occur in nature. 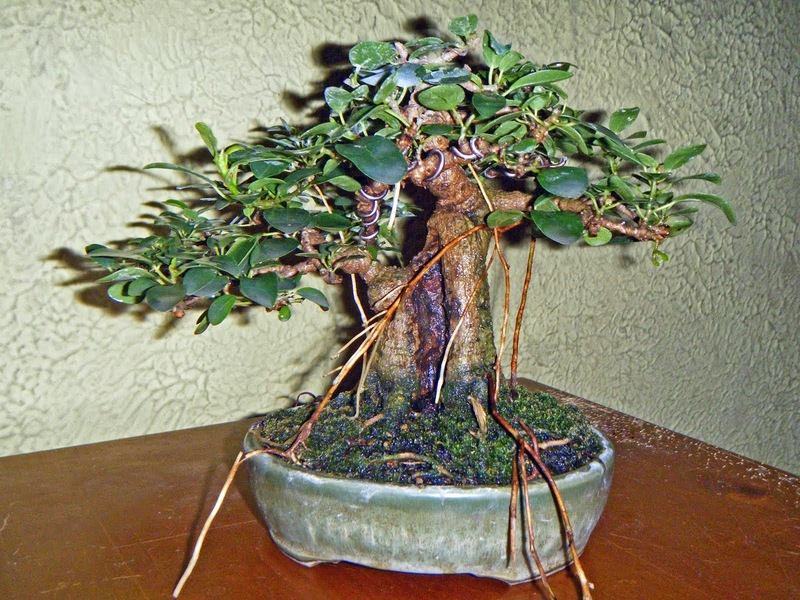 I believe this small neagari tree is an azalea. Whatever it is, it is well-done and the display is creative. 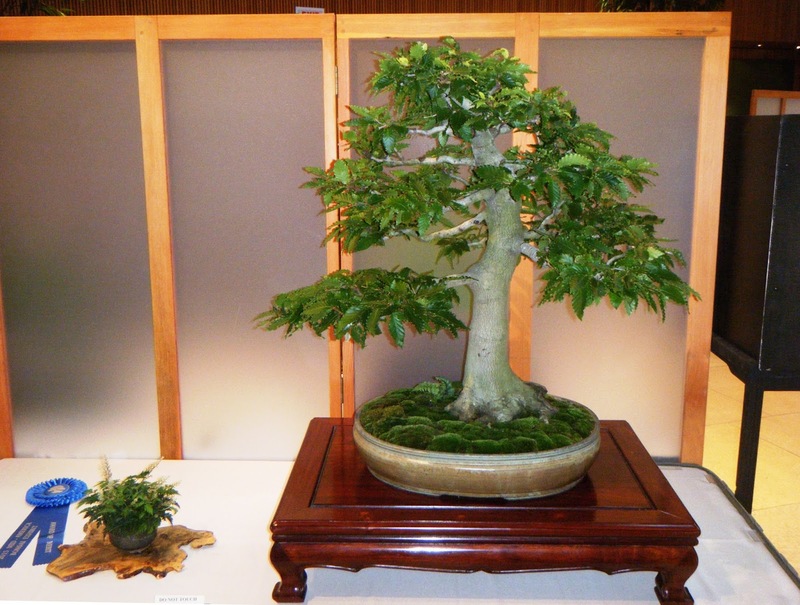 I came back to this quince bonsai several times, just to enjoy the skillful match of the pot color to the tree! And speaking of pot color, only on my second look did I realize just how brightly colored this Chinese pot is! Yet, within the composition, it doesn't overpower the other elements or pull the eye away from the pyracantha it holds. That took a well-trained eye. Another tip-o'-the-hat to Bill Valavanis. 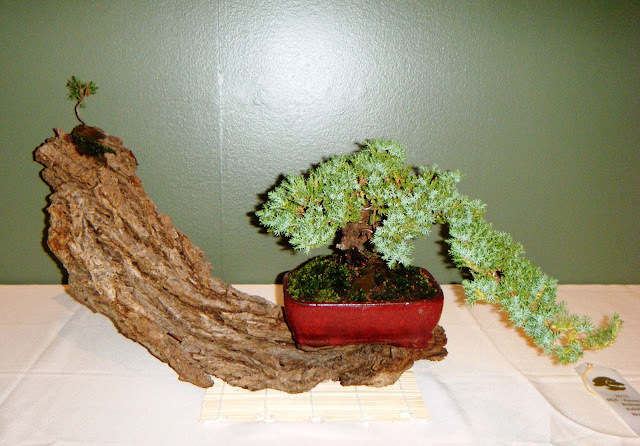 Who says the art of bonsai can't be whimsical? 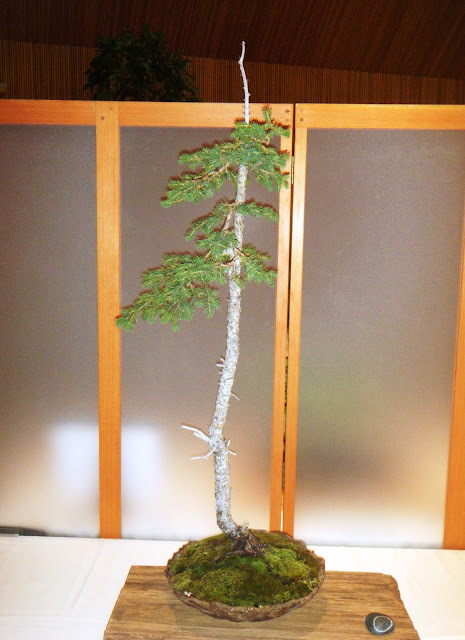 The accent plant at the top of the "slide" is a juniper seedling. 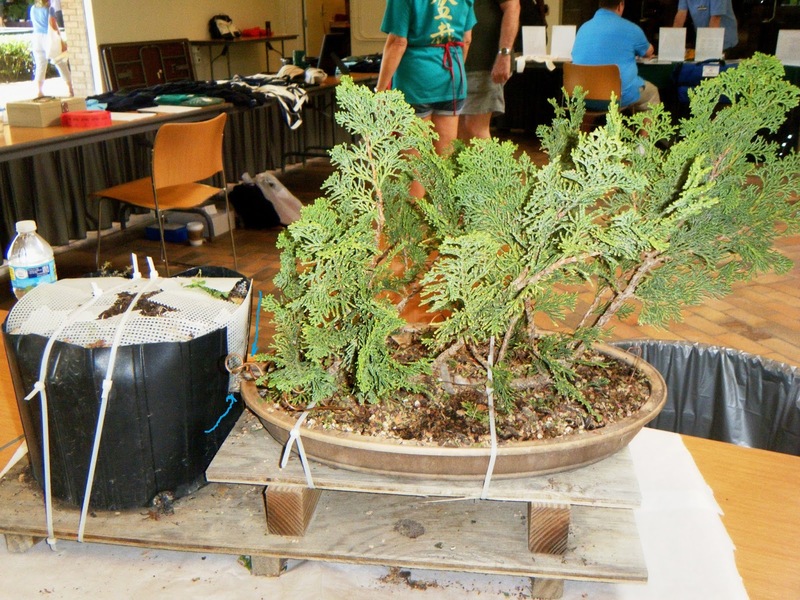 The American Bonsai Society always has a presence at the Mid-America, selling books and other items as well as offering free bonsai information in various ways: such as this demonstration of a raft-planting-in-progress. The tree is a Thuja, probably T. occidentalis. The original rootball is on the left; you can see the measures that have been taken to keep it intact and easy to water. Regrettably, the scheduled headliner for this year's Mid-America had to withdraw a few weeks before the event. 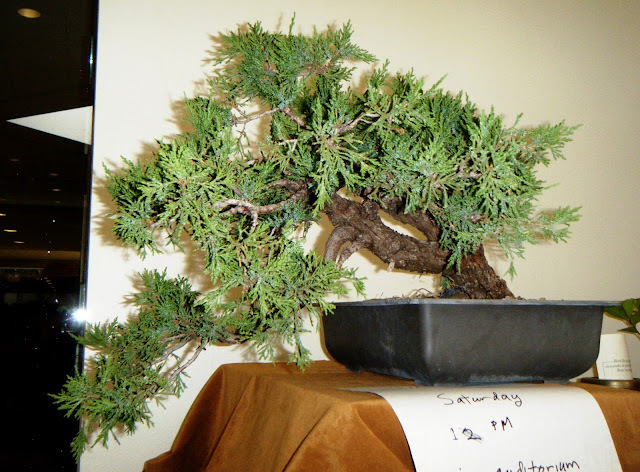 Ivan Watters, long-time bonsai artist and teacher and a former curator of the Garden's own bonsai collection, was asked to stand in, almost literally at the last minute. In my opinion, he did an outstanding job, especially under the circumstances. Kudos, Ivan! Here are a few pictures from the headliner's styling demonstration on Saturday afternoon. Please forgive the quality of some of the pictures; my little camera still doesn't always play nice in the Regenstein Center auditorium. "Let the tree tell you what it wants to be" (Jokn Naka) and planned his design around that branch. Ivan explains a point while Tim Priest and Steve Jetzer, two of his former students, assist with wiring. Finished for the time being. 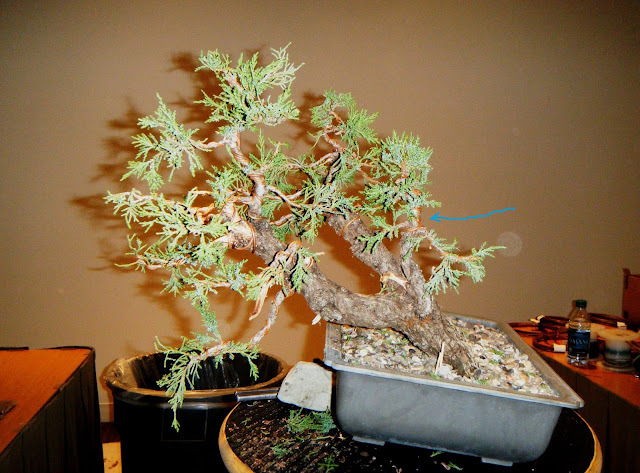 The blue arrow points to the smaller branch that Ivan decided to feature. I look forward to seeing this tree again as it develops over time.